“Yoga at the Nusantara School of Difference”, by Rahel Wasserfall. 2017. Yoga practice at the Nusantara School of Difference in Indonesia is among the many group activities fellows engage in during a typical program…. “Broken Politics and the Hope of Discomfort”, by David W. Montgomery. 2017. Maydan. January 19. These are days desperate for answers. In both practical and existential terms, people are asking what Trump’s Electoral College win – and presidency – means. Does his combative style represent a new populism? Does his presidency give legitimacy to racist and fascist sentiments? Is this a harbinger of America’s moral decay or an opportunity to instantiate a particular moral vision that will aright past indiscretions? Many in our country are uncertain, anxious, and afraid, while others feel vindicated and optimistic. The tension speaks to a divide, not a way to bridge a divide. Bridging the divide is not about overcoming it, nor is it about acting as if there is no divide. The 2016 presidential election made the division within our country feel insurmountable…. “The Burkini as a Mirror”, by Adam Seligman. 2016. openDemocracy. August 25. Last week, the mayor of Oye-Plage in France was so disturbed by seeing a woman in a burkini on the beach that he is planning to ban such a garb from the beaches of his own town. This reminded me of some of my own experiences in the past that may just be relevant to the current debates over the burkini in Cannes, Marseille and other beaches in France. About fourteen years ago I was in Jordan with my not-yet-adolescent daughter. We were in a goldsmith’s shop in Amman looking at jewelry. The shop was very small, almost a cubicle. At one point six to eight women entered. They were totally covered by burkas; only their eyes were partially visible through a bit of lacework. This was the first time I had found myself in such a situation, in a very small space, surrounded by a group of women of whom I could see nothing…. “How Big a Threat Is Islamic State in Central Asia?”, by John Heathershaw and David W. Montgomery. 2016. The Conversation. April 11. Whether looking at divided cities or working with populations on the margins of society, a growing number of engaged academics has reached out to communities around the world to address the practical problems of living with difference. This text explores the challenges and necessities of accommodating difference, however difficult and uncomfortable such accommodation may be. Living with Difference draws on fourteen years of the theoretical insights and unique pedagogy developed by CEDAR—Communities Engaging with Difference and Religion. CEDAR has worked internationally with community leaders, activists, and other partners to take the insights of anthropology out of the classroom and into the world. 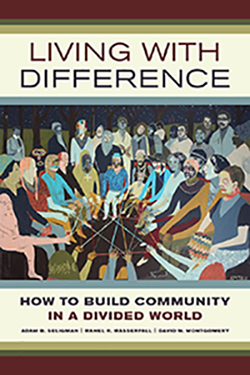 Rather than mitigating conflict by emphasizing what is shared, this work argues for the centrality of difference in creating community: it seeks ways not to overcome or deny differences, but to live with and within them in a self-reflective space and practice. Living with Difference also includes an organizer’s manual for implementing CEDAR’s strategies in one’s own community. “Islam and the State in Central Asia”, by Adeeb Khalid. 2015. Turkish Review. September 1. This post is part of the CEDAR’s partnership with the UK’s Royal Institute of International Affairs (Chatham House), George Washington University, and the University of Exeter in organizing a two-part conference on “Islam, Secularism and Security in Central Asia and Beyond,” part of a British Council USA Bridging Voices dialogue. The Rev. Dr. Toby Howarth, CEDAR alumnus and codirector of the 2009 CEDAR/ISSRPL program in England, was recently named the new Bishop of Bradford. “Is Tajikistan Really Jihad’s Next Frontier?”, by Edward James Lemon. 2015. Exeter Central Asian Studies Network. June 13. “What Does the Halimov Defection Tell Us About Tajikistan?”, by John Heathershaw. 2015. Exeter Central Asian Studies Network. May 31. “It’s Not All About Islam: Misreading Secular Politics in the Middle East”, by Stacey Gutkowski. 2015. openDemocracy. April 25.